LAS VEGAS – I had no intention of bringing anyone to tears. A dozen people, including myself (Las Vegas Review-Journal photo of the back of my head), testified on Monday, August 17 before the Nevada Supreme Court Guardianship Commission empowered to investigate hundreds of cases of elder exploitation. To the dismay of at least two Commissioners, the hearing was covered by national media. 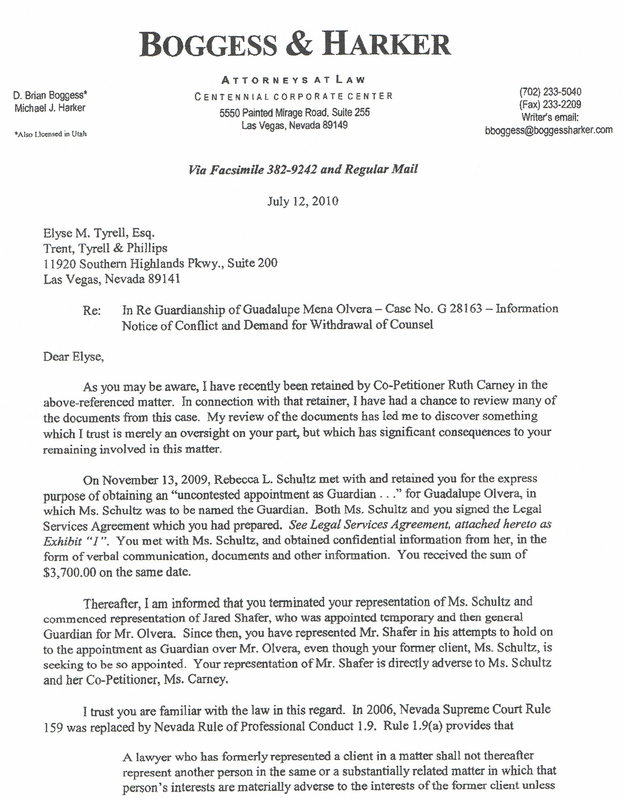 The witnesses told of more than thirty years of court sanctioned thievery at the hands of several local for-profit guardians and their crooked lawyers who have an obvious stranglehold on several Clark County Family Court judges and their appointed hearing master. 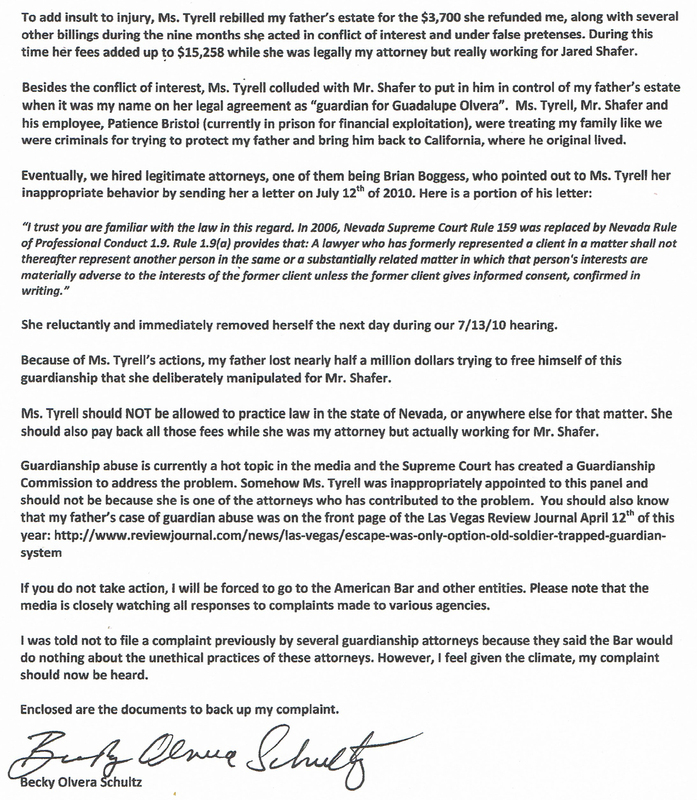 Elder law attorney Elyse Tyrell and Family Court Judge William Voy are appointed members of the Guardianship Commission, though many believe both have serious conflicts of interest. During testimony, Commission member Tyrell, her law firm, Trent, Tyrell & Associates, and Commissioner/Family Court Judge Voy (left) were named repeatedly in victim’s testimony as being a part of the problem, not the solution. This claim was based on both Commissioners long term legal representation of for-profit guardian Jared E. Shafer. Voy, prior to being elected to the Family Court, reportedly represented Shafer in over fifty court cases, and Tyrell took over the highly profitable job of representing Shafer after Voy’s election. Both have been asked to step down from the Commission, but both have so far refused. Ironically, Tyrell and Voy’s past and present client, Jared Shafer, is the poster boy for why the Commission was formed. 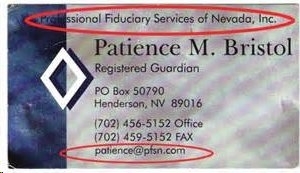 Shafer, his company Professional Fiduciary Services of Nevada, Inc. (PFSN), former PFSN guardian Patience Bristol who is currently serving 3 – 8 years in prison for exploiting PFSN wards, Current PFSN manager Amy Viggiano Deittrick, Wells Fargo Bank Trust Department, and several other Shafer abettors are currently being sued in U.S. Federal Court under RICO statutes by the family of the late Guadalupe Olvera whose estate was bled of over $430,000.00 while under the court sanctioned control of Shafer and his crew. Neither Tyrell nor Shafer responded to requests for comment for this column. 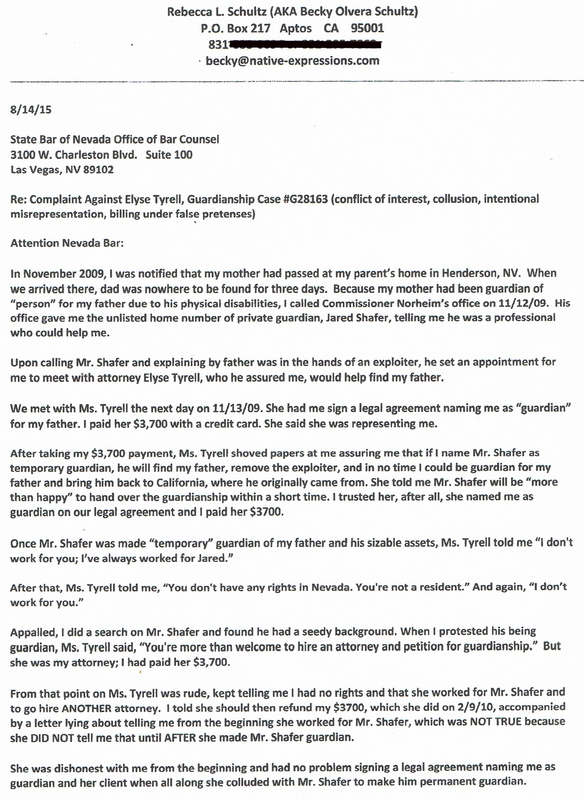 Based on “Elder Law Attorney” Elyse Tyrell’s on again – off again involvement, alleged improper receipt and dissemination of confidential information, and admitted conflict of interest in Mr. Olvera’s case, the complaint below was filed on August 14, 2015 with the State Bar of Nevada. 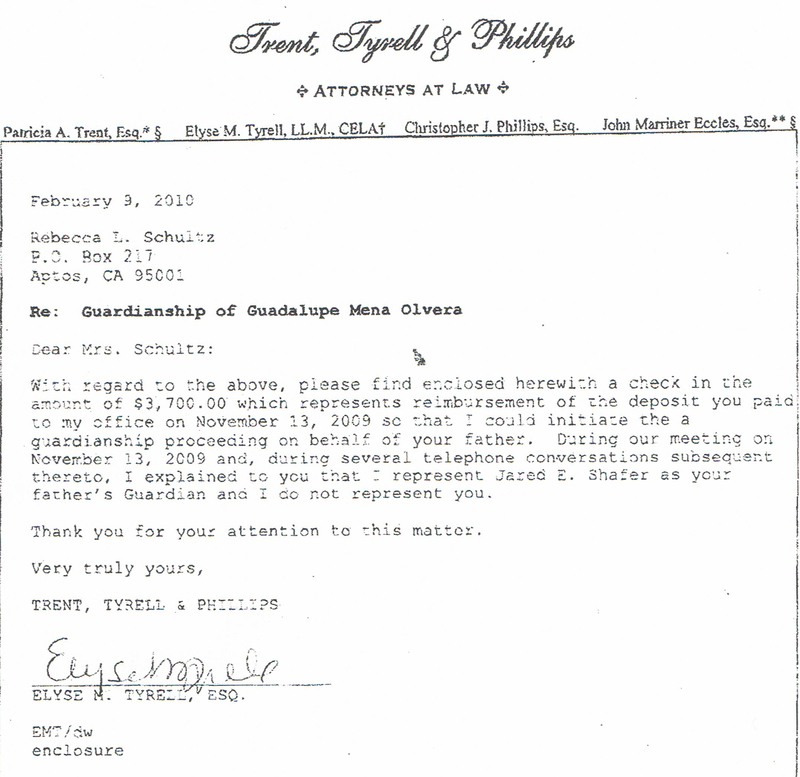 After losing his civil rights and $430,000.00 of his estate while under guardianship in Nevada, then 90 year old Guadalupe Olvera in September 2010, disobeyed the orders of Judge Hoskin and “Hearing Master” Jon Norheim, and moved back to Santa Cruz, California to spend his final five years with his loving family. 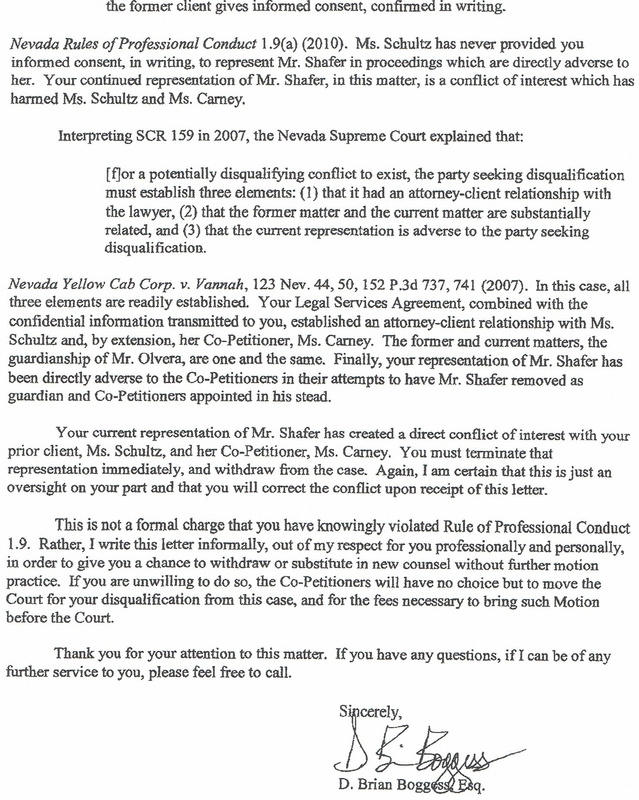 Upon learning of Olvera’s escape, Shafer ordered Hoskin to issue a warrant for the arrest of Olvera’s only living child, Becky Schultz, for the crime of complying with her father’s wishes, while Shafer continued to drain funds from Olvera’s Wells Fargo Trust account in Nevada to pay lawyers to fight for his return. 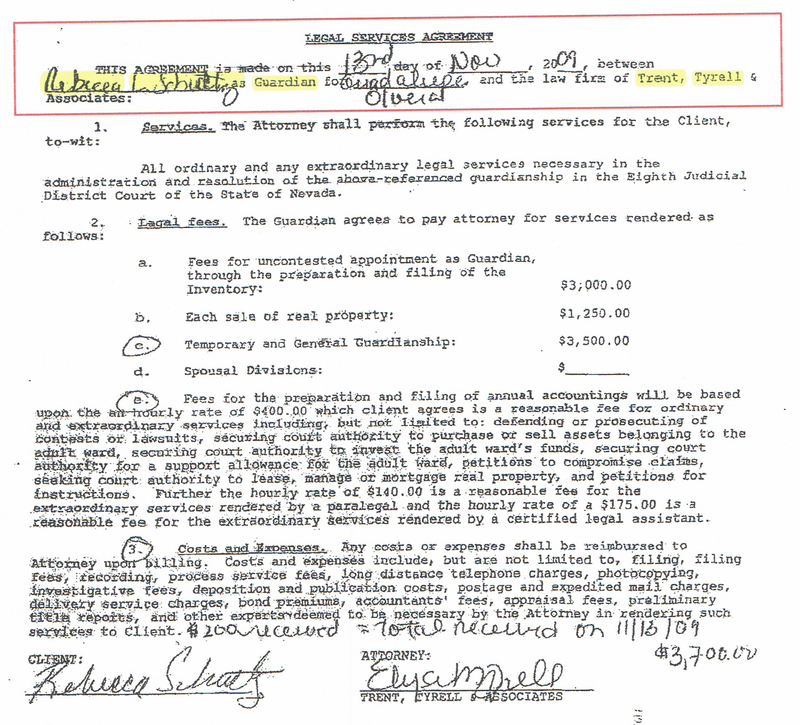 Out of anger, Shafer and Patience Bristol (before she was convicted of exploiting the elderly) filed aSLAPP suit against Schultz, and the son in law of another former PFSN “ward,” claiming defamation. The suit was a typical example of how the courts can be improperly used to discourage people from speaking out publicly against wrongdoing. The lawsuits have since been dismissed. 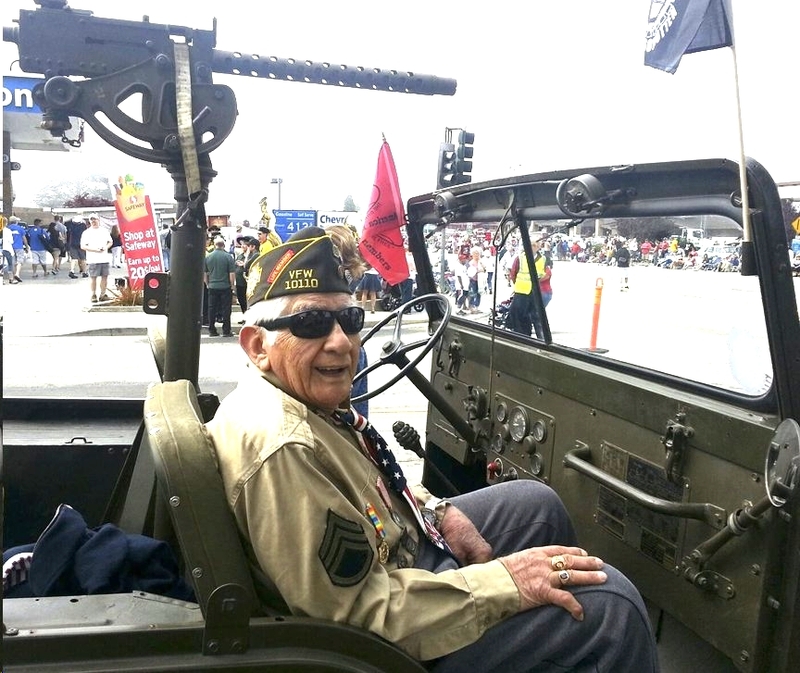 With Mr. Olvera safely back in Santa Cruz, the World War 2 hero hired a California attorney who immediately filed a petition in California Superior Court to liberate him from Shafer’s exploitation and abuse. 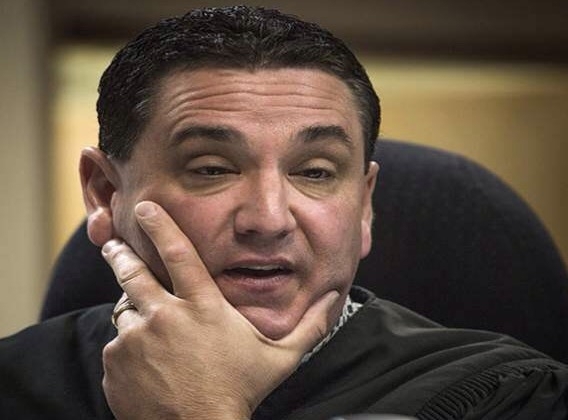 On August 21, 2013, Shafer’s guardianship was terminated after the Court determined that Olvera had been mentally competent all along, and never needed to be under any guardianship since the death of his wife. 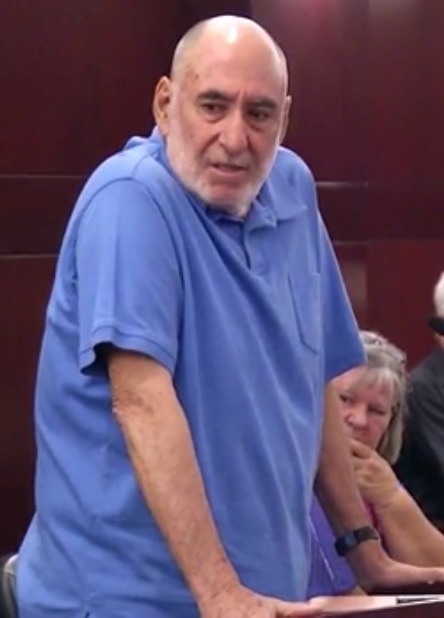 The court also quashed Shafer’s arrest warrant so Becky Schultz could return to Nevada with her father to help him sell his lavish 3000 square foot Henderson Sun City Anthem home without the fear of being arrested, a hillside home that many believed Shafer had his eye on. 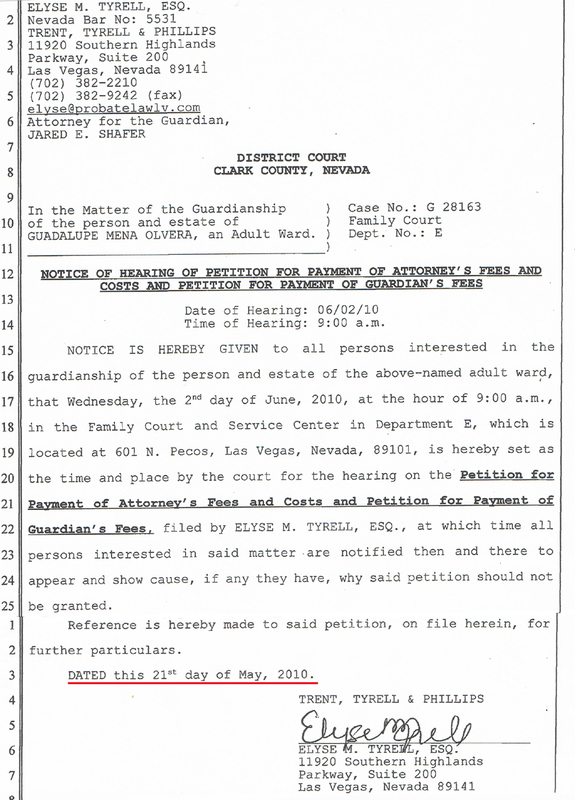 Now, based on the plight of the late Guadalupe Olvera, and the testimony of living guardianship abuse victims like Rudy and Rennie North, Julie Belshe, Thomas Gaule, and Elizabeth Diane Indig, who bravely came forward this summer along with others to testify before the legitimate members of the Supreme Court’s Guardianship Commission, the highest court in Nevada has wisely begun to take action for the first time to put an end to guardianship abuse and exploitation in our state. Unfortunately, at least two of the Commissioners are not serving the best interests of victims while they both appear to care only about the enrichment of certain for-profit guardians who have employed them as attorneys and paid them generously from the bank accounts of their victimized “wards” of the court. Hopefully, the other members of the Commission will not take them seriously. To read this complete story online at Inside Vegas, and related articles, click here. Several wards and their families ... have brought their complaints to the police. 'They can’t even get their foot in the door,' said Adam Woodrum, estate lawyer.